Introduction. Below you will find many months of Sunday morning and evening sermons in video, audio, and PDF format that you can stream to your computer device. Lasting roughly 30-40 minutes, these sermons by various preachers and guest speakers cover a wide variety of important Bible-based topics for all audiences (e.g., non-Christian, new Christian, mature Christian). You can listen to these sermons in chronological order, scroll to find titles of interest, or do a keyword search using your browser. You can also download these files depending on your computer's operating system. For Windows, you can "right click" on the link to access a "Save as" command. For Apple, hold the "Ctrl" key when clicking on the link to access an equivalent command. For some mobile devices, touching and holding the link will do the same. 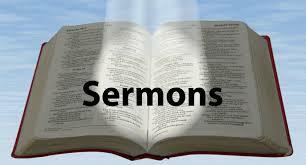 Unless otherwise noted, these sermons were given by Alan Hitchen.